is Mexico’s treasure coin and is currently minted at Casa de Moneda de Mexico, the oldest mint in North America, which was established in 1535. The Libertad was issued in 1982 by the Banco de Mexico, and was re–designed in 1996. These beautiful brilliant coins are Mexico’s equivalent of the US Silver Eagle. 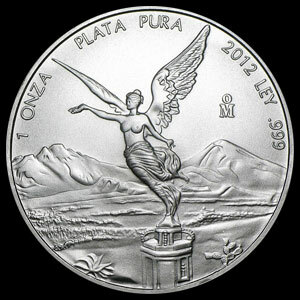 Each silver Libertad contains one troy ounce of .999 fine silver. The obverse of each coin depicts two key symbols emblematic of Mexico’s rich heritage, the Angel of Independence Statue and the two Mexican volcanoes, Popocatapetl and Iztaccihuatl. 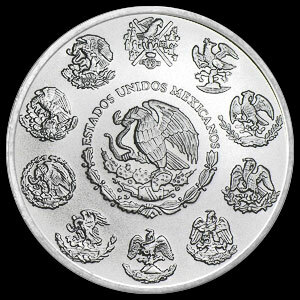 The reverse depicts the National Seal of Mexico – an eagle with a snake in its mouth – along with the weight and year of issue, and Mexico’s official name in Spanish, Estados Unidos Mexicano. Libertads are one of the most recognized bullion coins on the market for collectors and investors to buy.